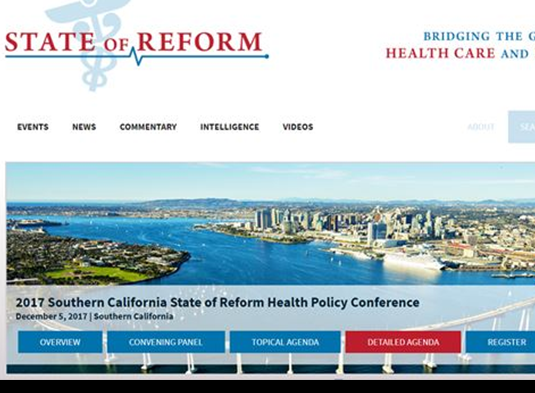 Steve Rimar, CEO and Founder of Analytica Consulting, a technology services firm that specializes in data analytics and architecture, recently presented at the State of Reform Health Policy Conference in San Diego, December 5, 2017. The State of Reform conference focuses on bridging the gap between the health care marketplace and health care policy. This conference is one of the largest, most diverse assemblies of health care executives and health policy leaders that that influence health care policy and administration in the state. The 2017 Southern California Conference had over 70 speakers and experts from across the spectrum of care. Mr. Rimar’s conference topic was “Technology as a Tool for Care Improvement”. He discussed how data is transforming healthcare along with case studies. Joining him in a panel discussion was Tanya Dansky, MD: Chief Medical Officer, Care1st Health Plan and Barbara DeBuono, MD: Vice President, Clinical Strategy & Value Based Care, 3M Health Information Systems. The panel discussed various use-cases and experiences with technology and the impact on the future of health care.